After a rather non-eventful Australian Grand Prix came two more races of 2017: in China and Bahrain. Were they any more telling as to how the rest of the season might unfold? To a degree – while giving hope for a fiery battle for the title, they also brought all-too-familiar sights, spoiling those hopes somewhat. Here’s what we’ve learnt so far. The standings don’t lie: after three races, the Prancing Horse is topping the charts, both in drivers’ and constructors’ classifications. The former has been truly earned by Sebastian Vettel, who – in some part with skill, in big part with luck – kept himself at the front of the 2017 grid so far, to claim the chequered flag twice. 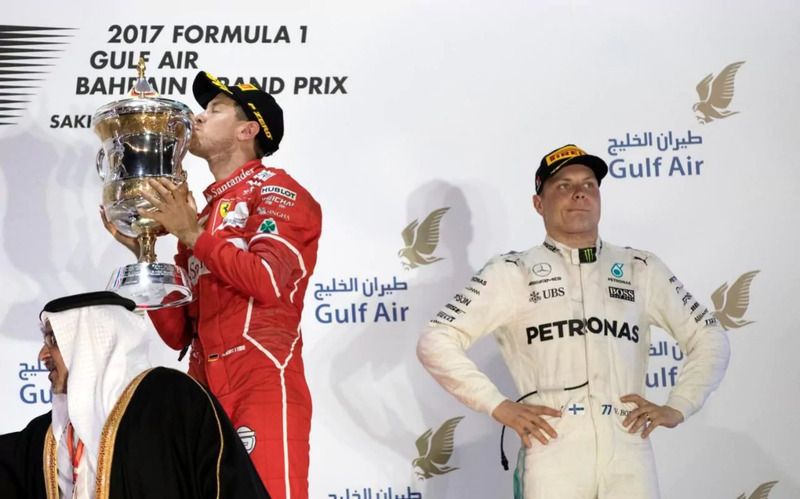 Albeit losing the win to Lewis Hamilton in China, the German was back on form in Bahrain, where he made the most of his second-row start to sweep past the Brit on the first two corners and move into charge for the lead, then occupied by the other Mercedes. Once out of Hamilton’s DRS range, Vettel was the first to dive into the pits for a new set of super-soft boots, committing to a quick pace and a second stop later on. The timing proved perfect, as soon after the safety car was deployed following a crash between Williams’ driver Lance Stroll and Toro Rosso’s Carlos Sainz Jr’s, ending both of their races. While the SC can benefit tyre change-outs by neutralising the whole field, it proved the opposite to the two Mercedes, both of whom had painfully slow stops, and ended up getting split up by Red Bull’s Daniel Ricciardo when exiting the pits. Ricciardo was cause of more woes to the Silver Arrows, as Hamilton ended up with a five-second penalty when he slowed down on his entry into the pits and on the trajectory of the Red Bull, delaying the Aussie according to the stewards – which the Brit accepted the blame for after. The safety car malarky opened the door for Vettel, and he grabbed the opportunity from the restart on lap 17 to the end of the race – defending from Hamilton, who relentlessly chased the win until the last lap, dramatically cutting the German’s advantage in the pursuit. 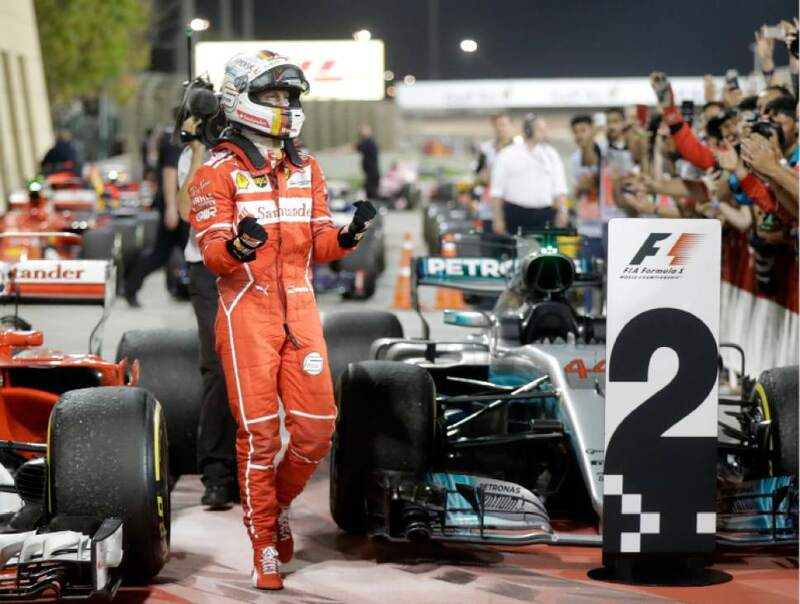 Vettel’s joy for coming out victorious was plain to see – and so was his team’s, with the Italian anthem sung by the whole Ferrari crew, and probably assisted by numerous fans. Baffled: having stood the chance of his first F1 win, Bottas still doesn’t quite understand why it went so wrong in Bahrain. While we might pretend the competition has got fiercer, in fact the Silver Arrows are still the mightiest outfit on the grid. What they might be lacking in speed on some tracks that might favour Ferrari, they make up in reliability and overall performance – what better proof than the consistent top times in practice sessions and qualifying, and most of all – Hamilton’s charge to catch Vettel in Bahrain, almost rendering his five-second penalty irrelevant. But it was a bit too early to hope for his first career win to follow – the Finn visibly struggled with his car from lights off on Sunday, and only managed to bring it home in third. As it turned out later, the culprit was a faulty generator used to set up his tyres ahead of the race, which resulted in high pressure in the rears. “Stint one, we can explain the performance with the tyre pressures being just way too high,” Bottas said. “It was feeling like on marbles. “Stint two and three, there is no explanation why the rear end wasn’t working. “We’d like to give equal opportunity at the start of the race, I think we owe it to them,” said team boss Toto Wolff. Despite debatable intra-team politics and infrequent reliability concerns, the team is still the most consistent in terms of delivering championship points – and they have to do little more to edge to the lead once again. Despite the early end to his third 2017 race, Verstappen is still high in the driver’s standings. 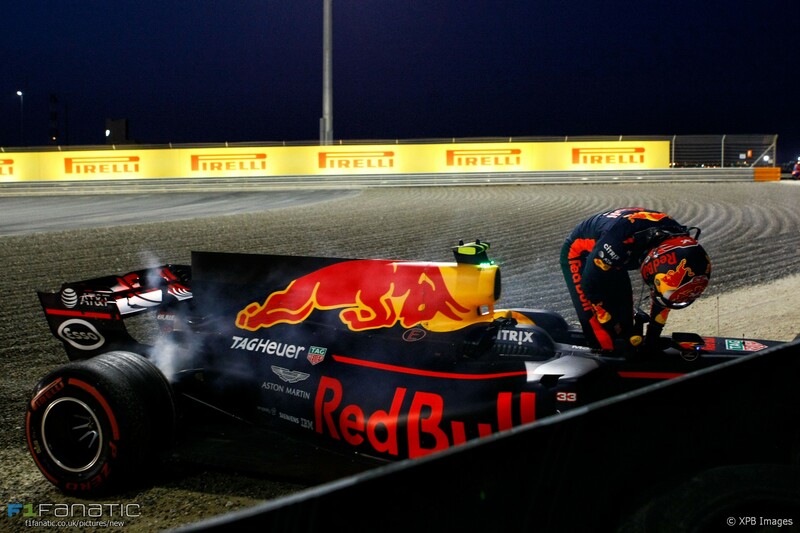 The shocking mid-2016 season decision to take a Toro Rosso youngster and sit him in the champion-making seat had paid off for Red Bull, as Max Verstappen continues to impress – even if his Bahrain outing resulted in a fiasco. The third race of the season came to a sudden end for the Dutchman, when he was struck by a brake failure on his exit from the pits on lap 11, and ended in the barriers. But a week earlier was a completely different story. After starting the race from 16. due to a power failure during the Chinese GP qualifying, Verstappen shuffled through the field and took advantage of the safety car following the crash of Sauber’s stand-in Antonio Giovanazzi. By lap 7 he had moved to 5., and shortly after overtook Raikkonen for 4. He then went on to overtake his team-mate Ricciardo, to cross the line in 3.; now, even despite his DNF in Bahrain, he is 5. in the driver standings. Ricciardo, in turn, (who’s experienced his own DNF in a disastrous home race) has been in the same boat as Raikkonen, trading sub-podium places with the Finn, so far unable to challenge for the win – but not for the lack of trying, as the Aussie has performed a bunch of his now famous heart-stopping overtakes, making the spectacle that much more enjoyable for the viewers, as well as and the drivers involved in the action. Both Red Bull drivers concede their challenger still has a way to go to truly get up to the front of the grid among all the red and the silver – but when (if) it does, we can be sure to have even more excitement on our hands. It’s been going from bad to worse for McLaren, who are now on the bottom of the standings – and although their 0 point tally equals that of Sauber, at least the Swiss outfit has seen a bit more on-track action than the British team. Fernando Alonso remains the only hero of the squad, while causing waves at the same time – not only because of his vocal disappointment in the machine (“I have never raced with less power in my life,” he said on the team radio in Sakhir), but also his shocking announcement to abandon the historic Monaco GP, to race at the Indy 500 instead. The news received a mixed reaction from the grid, but the divide was more or less balanced: the drivers seemed to think it was a good idea, the team principals suggested McLaren have lost their minds to allow this. The team, in turn, who promote Alonso’s entry together with Andretti Autosport and Honda, are actually prepared to do it all again in 2018… this whole commitment becomes less surprising when you realise it’s driven by McLaren’s new CEO who replaced Ron Dennis – Zak Brown, who happens to be American. To satisfy that ambition, the two-time Champion, and – more crucially in this case, former Monaco GP winner (in 2006 with Renault), would still have to attempt a Le Mans 24 challenge, and come out victorious – although for that he might exchange tips with Nico Hulkenberg, who now happens to drive for – yes – Renault. As for Alsonso’s current chances of adding a third F1 title to his name, that seems rather unlikely, as the biggest problem of the McL32 challenger is that no one knows what’s truly wrong with it – other than the fact the Honda power unit is not playing ball with the rest of the package. The situation is so bad that the team admitted to be baffled by a sudden resurgence of the car during Bahrain in-season testing that followed the race weekend. So much so that Stoffel Vandoorne – who’s McLaren didn’t even start in Bahrain – completed a full testing programme without engine problems, setting the fourth best time overall and completing 81 laps. 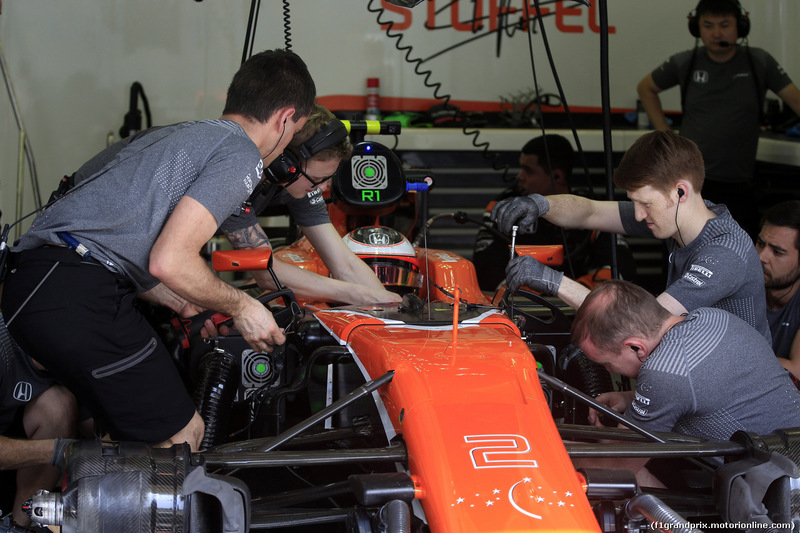 “If we knew…this is the problem, I don’t know,” the team’s racing director Eric Boullier said about the sudden improvement in form. No one is actually expecting this improvement to last, so the rest of the F1 Strategy Group is stepping in – and, allegedly, Mercedes is taking up the mantle of solving Honda’s problems going forward. Easy does it: Force India have quietly put themselves at the front of the “best of the rest” league. Talking of the mid-field, there’s only one player that is truly shinning bright at the moment: Force India. Even if just by a point, the pink challenger team is the best of the rest – just outside the top three in the constructors’ standings. And no wonder – although not leading point scorers, both Force’s drivers have been adding to the tally in all of the races so far – and it has not been plain sailing. Despite starting 18th in Bahrain, after aborting his timed lap in Q1 due to yellow flags, Sergio Perez climbed up the field to finish in 7. – hailing this his “perfect race”. 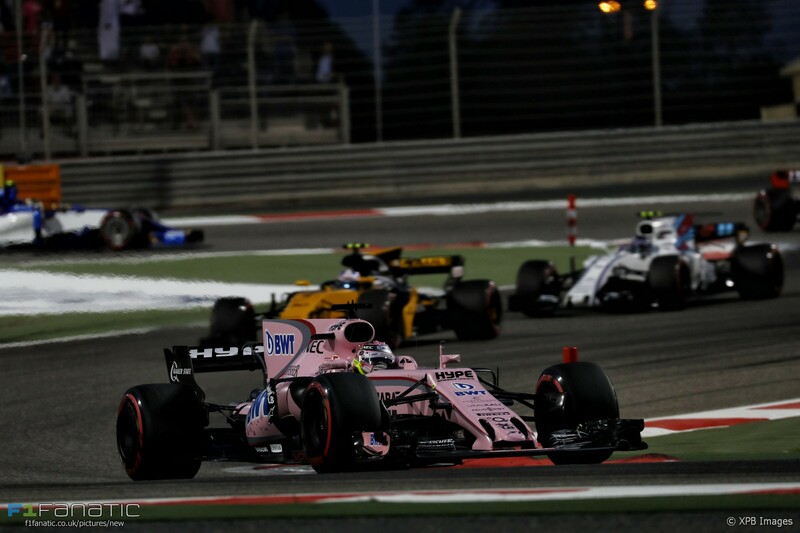 At the same time, the team’s junior Esteban Ocon continues to impress, having finished 10th in all three races with the team – in Bahrain with an advantage of 24.2s over Sauber returnee Pascal Wehrlein. As for the rest of the grid behind them, there have been some shines of greatness, but for most part it’s still the usual suspects that are making the headlines.